This post was authored by Edmund Brumaghin, Earl Carter, Warren Mercer, Matthew Molyett, Matthew Olney, Paul Rascagneres and Craig Williams. Note: This blog post discusses active research by Talos into a new threat. This information should be considered preliminary and will be updated as research continues. Talos recently published a technical analysis of a backdoor which was included with version 5.33 of the CCleaner application. During our investigation we were provided an archive containing files that were stored on the C2 server. Initially, we had concerns about the legitimacy of the files. However, we were able to quickly verify that the files were very likely genuine based upon the web server configuration files and the fact that our research activity was reflected in the contents of the MySQL database included in the archived files. 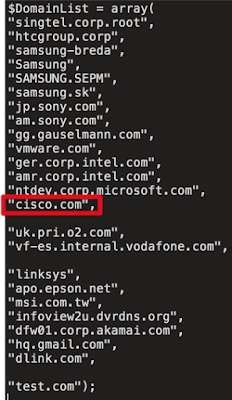 In analyzing the delivery code from the C2 server, what immediately stands out is a list of organizations, including Cisco, that were specifically targeted through delivery of a second-stage loader. Based on a review of the C2 tracking database, which only covers four days in September, we can confirm that at least 20 victim machines were served specialized secondary payloads. Below is a list of domains the attackers were attempting to target. 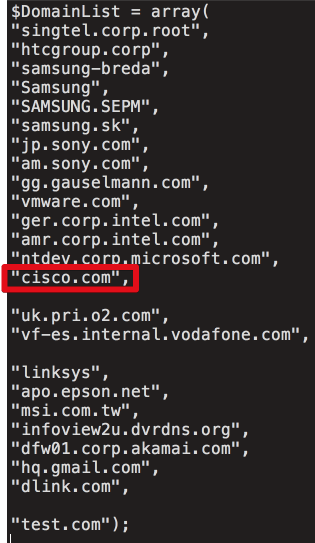 Interestingly the array specified contains Cisco’s domain (cisco.com) along with other high-profile technology companies. This would suggest a very focused actor after valuable intellectual property. These new findings raise our level of concern about these events, as elements of our research point towards a possible unknown, sophisticated actor. These findings also support and reinforce our previous recommendation that those impacted by this supply chain attack should not simply remove the affected version of CCleaner or update to the latest version, but should restore from backups or reimage systems to ensure that they completely remove not only the backdoored version of CCleaner but also any other malware that may be resident on the system.